Mallory and Savannah of Classy Clutter are pretty fearless DIYers, but Savannah admits this project gave her pause. We wanted her to show how to install a door knob on her bedroom door. Schlage door hardware is by far the easiest hardware I have ever had a chance to work with. I will be honest… I thought this was a job that I would have to enlist the help of my husband on. I was totally wrong! I was able to do this 100% by my myself, and it was very easy. 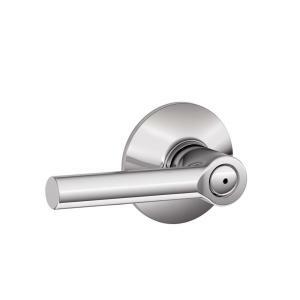 I chose a door lever with a sleek, modern look– the Broadway Bright Chrome Bed and Bath Lever, from Schlage. It’s simple, but very classic, and I am beyond thrilled with the look of it. Now this is how you are going to install the lever door handle. I purchased this two-panel door from The Home Depot and it already had a pre-drilled hole for the lock. My door jamb also already had a space to attach the strike plate. If you need to drill your own holes, be sure to follow the manufacturer’s instructions. There’s a template in the box that will help you. First, choose the faceplate to match the door. Then, simply install the latch by screwing in the two screws (I used my drill). Then, to install the lever you are going to line up the the holes and push them together until both the inside and outside levers are flush with the door. Then, simply screw them into place. Now it is time to install the strike plate. Line the holes up and then screw it into the door jamb. Now you are totally done and you can now enjoy the new hardware. I love this Schlage door lever because I feel like it really completes the look of my entire room. Its amazing how it really sets the tone for my master bedroom. Be sure to stop by our blog to see my entire master bedroom reveal HERE. Mallory and Savannah are the brains behind Classy Clutter. The blog began in July, 2010 when two moms were itching to share their creative projects and ideas with the world. Mallory and Savannah both grew up in Mesa, Arizona and come from big families. They have known each other since high school and their husbands are really good friends, too. Mallory and Savannah now have seven kids between the two of them. They love all things DIY and creating beautiful things.